It is incredibly rare that I get to eat out these days so when I do, I want food that's a bit different, tastes great and isn't going to cause my bank account to send me multiple alerts that someone has raided it. Leicester isn't exactly short on places to eat out now but there's a lot of chain restaurants which is fine but not always inspiring. And so on a very cold night last week, along with Laura from Extreme Housewifery, I was invited by The Rutland and Derby to try their winter menu. If your notion of pub grub is a plate of cheesy chips and a sad looking pie then clearly you have not been here. Taken on in 2008 by The Beautiful Pubs Collective, The Rutland and Derby has built a strong and steady reputation for delivering quality food and drink. So what's so special about their winter menu? The main thing though is that this is a menu that's been created by people who genuinely care about it. It all started when Sam (owner of Beautiful Pubs) set his chefs the task of creating a sharing menu for the party they were hosting to celebrate the anniversary of The Forge (another of their pubs). According to Sam, the food was one of the most talked about aspects of the party and so he asked the team to see if they could turn it into a proper pub menu. 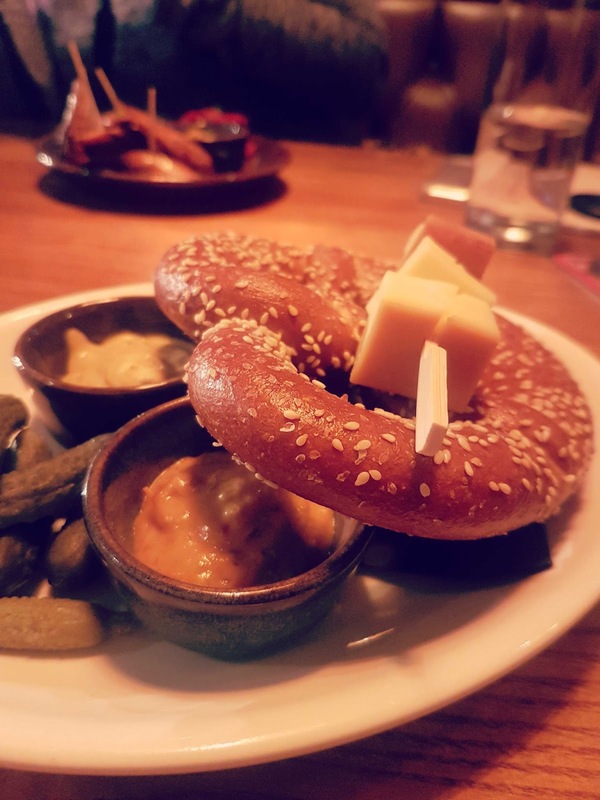 What delighted me the most is that his team went away and researched and researched in order to come up with dishes that drew on these tasty Germanic flavours but that could be created using seasonal, local produce and tailored to meet the flexibility of a pub menu. From the sharing plates part of the menu (always tricky for me because like Joey, I don't share food if I can help it...) we tried the bratwurst, fresh baked pretzel and ham and cheese croquettes. Croquettes may not sound German - of course they don't - but these are fluffy, delicious balls of ham and smoked cheese goodness. Served with homemade chilli jam (that I need to have delivered to me on a weekly basis because it is that good), they were surprisingly light but full of flavour with the balance between the smokiness of the cheese and the ham absolutely spot on. The slices of bratwurst were pretty addictive and full of flavour. The pickled red cabbage that came with it was a welcome punch of acidity to slice through the meat and I could've eaten a lot more of it. Then the pretzel. There can't be many things finer than warm fresh baked bread. Especially when it is soft and served with generous cubes of smoked cheese (the same sort as used in the croquettes) and some tasty mustard and did I mention it was soft and warm? So. Good. We also got to try the pretzel buns used for the burgers and again, soft and warm and honestly, I could eat this all day every day. We also tried the flammkuchen from the pizza menu. It was light and tasty with the onions a particular revelation. Normally I hate onions but these were sweet and smoky and the perfect topping with the bacon and creme fraiche. This would be perfect to share for that one drink (ok, two drinks) after work with friends. One of the key things for The Rutland and Derby is that the taste and the look of the food should be equal. They've cleverly recognised that word of mouth is one of the greatest advertising tricks out there and have pushed their kitchen teams to the test to produce 'Instagrammable' food. And, hey, it works! 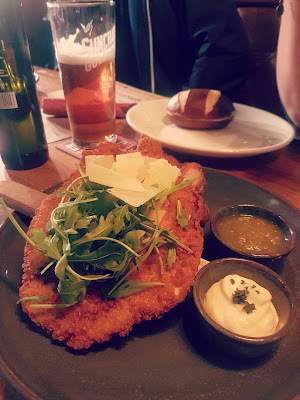 I was in a meeting a few weeks ago when I saw a picture of the chicken schnitzel on Instagram (I was scrolling to find something for the meeting honest!) and immediately wanted to cry because I was so hungry. Reader, it did not disappoint. Raindrops on roses, schnitzels, favourite things. Yes. Served with a salsa verde, lemon aioli and triple cooked wedges, it tasted as good as it looked. The flattened chicken breast was moist and covered in a perfect schnitzel crumb that was just the right amount of crunchy. It was so refreshing to eat something that had looked so good in a picture and have it meet expectations. You don't realise how rare that is until you taste it. Add to this an impressive beer list that will complement everything we ate, reasonable prices and you have yourself a really good meal out. Although it is a little off the beaten track, make the effort to come here and you will be rewarded. Disclaimer time! We were guests of The Rutland and Derby and as such were treated to our meal. I wouldn't recommend it if I thought it wasn't worth the money though. Also, The Rutland and Derby is technically part of the pub portfolio owned by the brewery I work for but is run as an independent business. I don't get paid to review pubs.